So here it is, folks…my first ever post on Normal Cooking! My husband, Blake, has been trying to get me to start a food blog for about a year now. I always just waved him off because, let’s face it, there are thousands of food blogs out there already. And I am NOT a trained culinary artist. Nor do I write my own recipes. Nor do I take amazing magazine quality pictures. So wait…why am I doing this again? Oh yeah…because people (in addition to my loving husband) have been asking me to. Even with all the other food blogs out there, people have a hard time finding normal, everyday, simple recipes to feed their families. Hopefully you will find some recipes that look tasty and easy! I mean if I can do it, you can too. And I mean that very seriously…I have not always had the gift of cooking, and I would’ve probably laughed in your face (politely of course) if you told me two years ago that I would be starting a food blog. Yet here we are. So let’s get started together! These first few recipes that I post will have only one picture, because I usually just take a picture of the plate once it’s all done. But I promise that in the future, this blog will have lots of step-by-step pictures! Our very first recipe will be…. 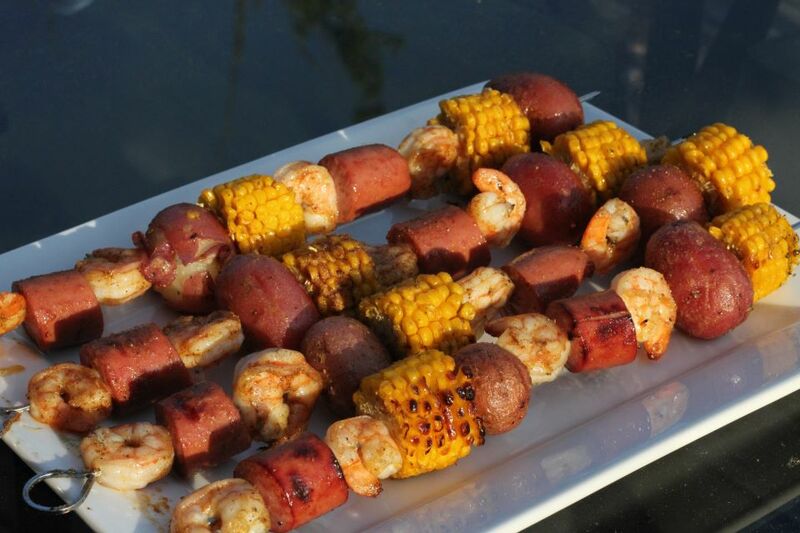 *drumroll please*……Shrimp Boil Kebabs! This dish is PERFECT for summer and would be a great alternative to typical burgers and hot dogs at your next cookout! Boil the potatoes in salted water over medium-high heat for about 12-15 minutes, until the potatoes are tender. Drain and rinse under cold water. Heat grill to medium-high. Clean and lightly oil the grill. In a small bowl, combine the butter, Tabasco and Old Bay. Grill kebabs turning and brushing with butter mixture occasionally until the shrimp are cooked through and corn in starting to char, about 8 minutes. Serve with lemon wedges. Looks amazing. Like a shrimp boil on skewers. Thanks for sharing. Can’t wait to see more cooks. Thanks! I’ll be posting a lot more soon as I try to get more content on my blog I guess that’s an excuse for more cooking? Thanks for reading! This looks AMAZING! Such an interesting alternative! You go girl! !